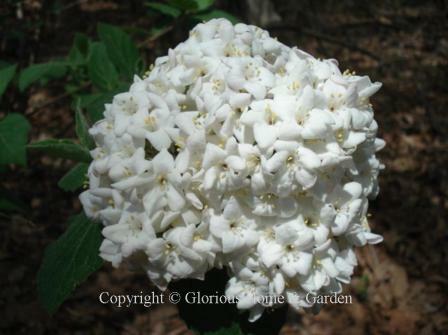 The list of spring flowering shrubs continues . . . There are so many species and hybrids of rhododendrons and azaleas, both evergreen and deciduous, that they rate their own page. Click here for more! Sinocalycanthus chinensis, Chinese wax plant, Zones 7-8. 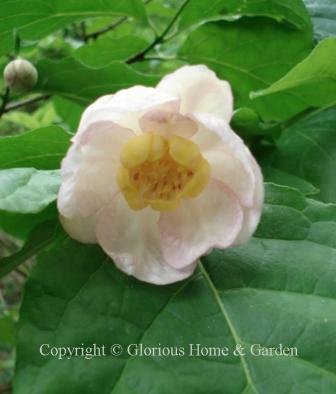 This charming spring flowering shrub is one of the parents of Calycanthus raulstonii 'Hartlage Wine,' Chinese wax plant is lovely in its own right with white flowers suffused with pink (but not fragrant), and large dark green leaves. Spiraea X bumalda 'Anthony Waterer,' Bumald spirea cultivar, Zones 3-8. 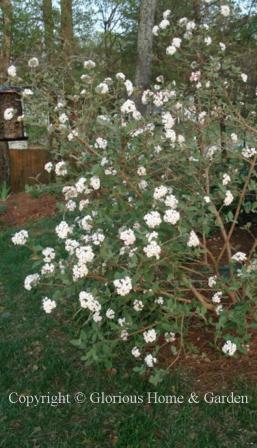 A smallish shrub, usually about 3' to 4' high, that makes it useful in combination with other shrubs. 'Anthony Waterer' has deep pink flat-topped yarrow-like inflorescences in late spring that repeat periodically into fall. This one, in fact, was still blooming in October at the Coastal Maine Botanical Gardens. 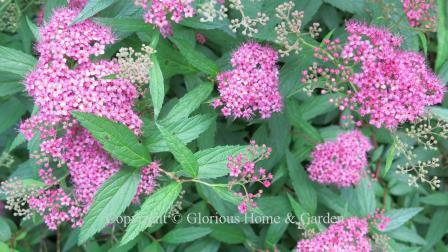 Spiraea japonica, Japanese spirea, Zones 4-8. 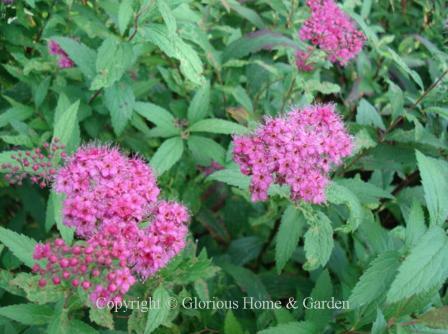 The mounding habit of spireas make them very easy to incorporate into the garden border or to mass in groups. One of the most popular of the Japanese spireas is 'Gold Mound' with its golden leaf color and pink flowers in spring is one of the best and it stays small at 2' - 3'. 'Shirobana' is very intriguing as white, pink and rose flowers occur together on the same plant with green leaves, also grows to a 2' -3' mounded shape. Spiraea prunifolia, bridalwreath spirea, Zones 4-8. 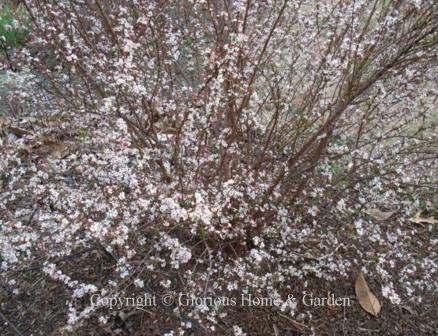 The old-fashioned bridal wreath spirea covers itself in tiny white flowers in spring. Nondescript out of bloom, it is nevertheless showy in full flower. Spiraea thunbergii, Thunberg spirea, Zones 4-8. This shrub is tiny in all its parts--flowers, leaves and stems. 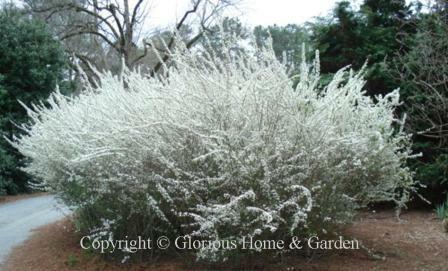 Tiny pure white flowers cover the shrub in early spring looking like a late snowfall. In fact, so eager to bloom is it that it will often open at the first sign of warmth in mid February in the South. 'Ogon' is a variety with golden leaves and white flowers, 'Fugino Pink' has pink flowers. Viburnum x burkwoodii 'Mohawk,' Burkwood viburnum, Zones 5-8. My 'Mohawk' viburnum is one of the delights of my garden, opening in late March to early April (Zone 7b). The deep pink buds open to 2-3" rounded clusters of flowers that are white inside and pink outside. The spicy fragrance is outstanding. It opens a few days later than my V. juddii, and together they perfume the garden for about a week or two. If only they could repeat! The rest of the year it is a handsome, dark green shrub of about 6' x 6' until it turns a brilliant orange-red to purple in the fall--one of the last to turn color in my garden. Viburnum carlesii, Koreanspice viburnum, Zones 5-7. This is a very fragrant viburnum and a parent of 'Mohawk' and Judd's viburnums. 2-3" clusters of pink buds open white. 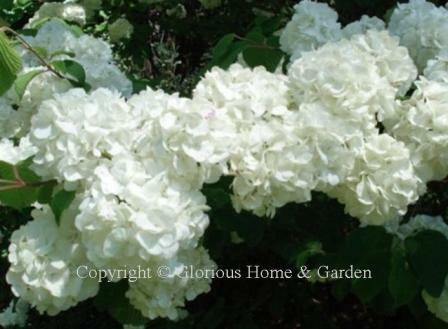 The clusters are a little larger and whiter than 'Mohawk' or Judd's and bloom in early to mid April. Viburnum dilatatum, linden viburnum, Zones 5-7. Blooming in late spring when the majority of spring flowering shrubs have finished, linden viburnum is covered with flowers resembling Queen Anne's lace. Reaching 8 - 10' at maturity, this shrub extends the seasonal interest in the garden with clusters of bright red fruits in the fall and leaf colors of yellow to red. Viburnum x juddii, Judd's viburnum, Zones 4-8. I have this shrub growing at the corner of my house and it fills the garden with delicious fragrance in early-mid April. The bloom clusters tend to be a little smaller than 'Mohawk,' and the individual flowers are white with just a tinge of pink on the underside. This is also an excellent shrub for outstanding fall color. Viburnum macrocephalum, Chinese snowball viburnum, Zones 6-9. 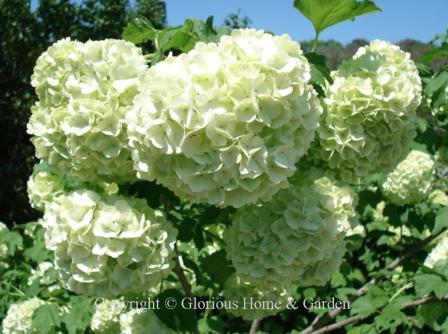 This plant is quite literally smothered with huge balls of sterile flowers in spring that open lime green and mature to white. 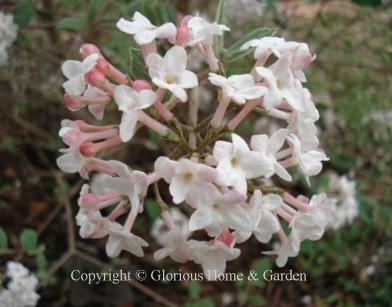 A dramatic, attention-getting, spring flowering shrub. 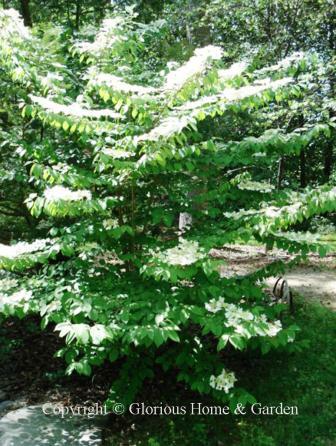 But beware, this spring flowering shrub can get quite large (10-20' h. with a similar spread depending on location) and needs room to spread or it will tend to overwhelm anything around it. The sterile flowers do not set fruit. Viburnum opulus, European cranberrybush viburnum, Zones 3-8. 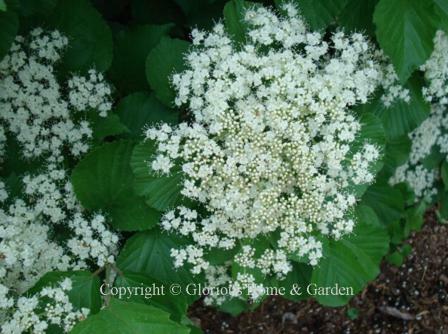 European cranberrybush viburnum has white flowers in mid-spring on a shrub of about 8-15' in height with similar spread. Bright red berries are produced in the autumn. The showiest form is 'Roseum' with snowball-like flower clusters that change from green to white rather like V. macrocephalum, but not as large. Viburnum sieboldii, Siebold viburnum, Zones 4-7. This can become a very large shrub from 15 to 20' or more in height, so care should be taken where it is sited. The white flowers are produced very generously completely covering the plant. Rose-red fruits in the autumn that birds relish. Weigela florida, weigela, Zones 6-8. 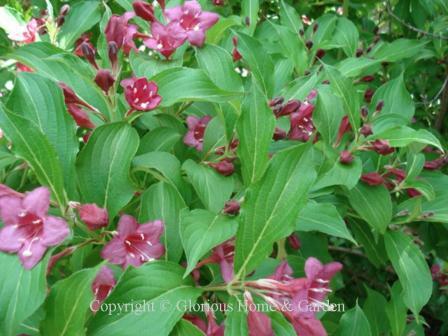 Weigela is a sort of old-fashioned spring flowering shrub that is nice to have for color as it blooms a little after the main onslaught of spring bloom. 'Champagne and Strawberries' is shown. 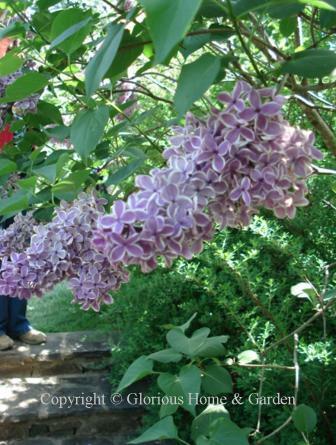 Click here for spring flowering shrubs A - E.
Click here for spring flowering shrubs F - P.